Recently, I went out with a few friends who have preschool and elementary aged children. Our conversation overflowed with stories of their children’s engagement with the world. They shared stories of how their kids embraced the May Day pole ceremony and how they react to beat-bop jazz and heavy metal. As a Youth Worker I too have plenty of stories up my sleeves. My favorite stories are ones where the child’s imagination shocks my own sense of the world. For instance, I handed out bags to the elementary kids to fill with presents. The first boy took the bag and looked at it and said, “My archenemies, we meet again.” I wish I still had these kinds of interactions with inanimate objects! In the opening quote, farmer, poet, and activist, Wendell Berry makes the distinction between fantasy and imagination. Imagination is that which is in the communal conscience. Fantasy, on the other hand, is a solitary moment of one’s desires without recognition of the community. In the US, fantasy is commonly related to going to space or sexual acts. First, everything that we learn about the world comes through sense data and the imagination. Like Aristotle and the British Empiricists, our minds are blank slates that are filled with our interaction with the world. This is in contrast to Platonism that says that we already have all knowledge we are merely wiping off the charcoal stains off our minds. Second, this is similar to the first, that we can know nothing unless it has been received from the senses. All of our knowledge comes from what we perceive from the material world. Haight says that everything that we think has an “imaginative residue.” When one thinks of dreams, which are often imaginative new events, they are not so far out of this world that one can explain them to others. Lastly, Aquinas wrote that one has an active and a passive imagination. Our passive imagination is what we store in our memory. Active imagination happens when we create new images out of the material world. Aquinas gave the example of making a golden mountain. Both things separated exist and are part of the world, but a golden mountain takes an active imagination to create. Understanding this through Berry’s definition, communities experience the world in similar ways, which is their passive imagination. For their active imagination, communities construct lexicons, habits, and relationships in particular ways. In the Christian tradition, this can be seen in the Gospels. The Johannine community culturally were Greco-Roman who used popular Greek Philosophy, aka Platonism, to speak of Jesus. Does this degrade John’s Gospel to lesser than God’s Word? Of course not! What it does show us is the deep importance of Jesus to their community. Around the world, Jesus and God are known by different names. 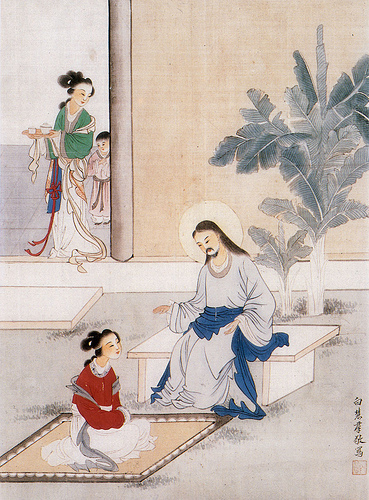 According to the liturgy in the Jesus Sutras of Eastern Asia, Jesus is prayed to as the Jaded-Face One. To be jaded in Eastern Asia means that to have experienced life to the fullest and thus be divine. The problem today is we emphasize fantasy too much. We have an active fantasy life and force those desires on others. The work of imagination is found in the midst of community. Of course, this is not perfect, but if we are aware and intentional in our imagination-creations then possibly we can create a better and more just society. What songs, stories, art work, dramas, etc. does your community gather around? How does your community engage with the other? How do others perceive your community? Christian communities around the world and throughout the ages gave the Divine a personal name. Has your community done this or have they used their experience with the Divine to add to God’s qualities? The summer staff eats dinner together every night. We talk about the evening program and our days with the groups. There comes a breaking point where laughter erupts and the conversation devolves into mindless rumble. Last week, this laughter evolved into playful criticism towards me. I lead the music for the evening program and I am not ashamed to say I pick songs that are indie. You know, songs from bands that no one has ever heard of or songs originally sung in different languages? The staff complained of hearing the same songs each week, although the youth love the songs that I play and every week sing with a different group. They called me a pseudo-hipster, which infuriated me and I proceeded in pretending to throw things and destroy the office. It takes the group at least two go arounds to really get into this song. Once this happens, the energy in the sanctuary is incomparable to other songs throughout the week. Youth, as well as adults, love it. I have come up with a few theories about this passionate energy. The youth are first filled with vigor, as they sing a song different from in their own churches. Second, the melody is catchy and resonates; they cannot help but jump around during the chorus. There are other responses, but I am going to focus on the fact that the youth are expecting/experiencing the kin-dom of God, where the world will be turned upside down. This is why they jump in joyous presumption that God is participating with them in creating something new. “The kingdom that Jesus called for was a kingdom ironically, one that was itself mocking the business-as-usual of the powers that be, one in which a divine madness reigned, even as it was, from the point of view of the Roman Empire, of the Brutality of the world, simple foolishness, outright stupidity” (15). The kin-dom that we are expecting is one of reversals. The youth groups observe reversals of cultural normalcy through urban gardens, Narcotics Anonymous Meetings, in small neighborhood churches reaching out into their communities through play. Explosions of reality occur at every location, most of it concrete and tangible with the senses. For example, when the youth uproot weeds that choke vegetables and herbs, they smell soil, manure, and hay; soil slips in their fingernails, and sweat drips from their forehead. This contradicts the common pattern they are used to, such as going to fast food restaurants, standing on hard tile, receiving food wrapped in paper, and drinking sodas with unknown ingredients.Eruptions of the kin-dom gives hope to the hopeless. They force one to reconsider the way they have been living. One can see the mountains move before their very eyes, if not now, soon with the coming kin-dom. The role of imagination appears in the middle of kin-dom and reality. Imagination lends one to think of a different reality where the impossible is possible, where the food deserts in north Philadelphia become places of lush gardens of vegetables and orchards of fruit, where people are treated with respect rather than contempt. Yet, it is much too simple to be cynical about reality, to allow the kingdom of the world to dictate our actions. For this reason, communities of believers must be the imaginative voices in their towns. A group of people where their imagination is intricate in their prayer life is those who practice the Ignatian Spirituality. One is asked to imagine scenes in their minds when praying, e.g. biblical scene of Mary and Elizabeth meeting while both are pregnant and John the Baptizer kicking in the womb while being near Jesus. These kind of imaginative practices must bleed into the very life in how we perform everyday. The imagination and the kin-dom to come should be intertwined and seek this new world, while trying our best to create something in the present. 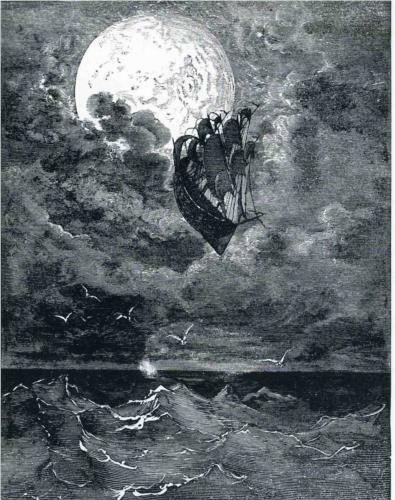 Gustave Dore, known for paintings of biblical stories, painted this beautiful picture titled “Voyage to the Moon.” It speaks to imagination and going to a realm of impossibilities.